Carol Elizabeth Beckner, 61, of Iaeger, WV, passed away Friday, February 1, 2019 at her residence. Carol was born April 1, 1957 in Baltimore, MD, a daughter of the late Stuart Daniel and Edna Rowe Robinette. 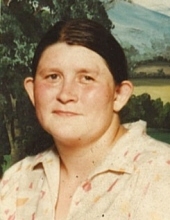 In addition to her parents, Carol was preceded in death by her husband, Billy Beckner; two children, Junior Edwards and Edna Louise Edwards; two sisters, Bonnie Louise Robinette and Bertha Robinette; and two brothers, Junior Robinette and James Robinette. Survivors include two sisters, Erma Jean Gibson of Sandy Huff and Virgie Beckner and husband Carl of Lick Branch; three brothers, Lawrence Robinette of Welch, WV, Ronnie Robinette and Lonnie “Rosie” Robinette all of Lick Branch, WV. Carol’s body has been cremated. A memorial service will be held at a later date. To send flowers or a remembrance gift to the family of Carol Elizabeth Beckner, please visit our Tribute Store. "Email Address" would like to share the life celebration of Carol Elizabeth Beckner. Click on the "link" to go to share a favorite memory or leave a condolence message for the family.